Home 'n Hosed: Three Months! 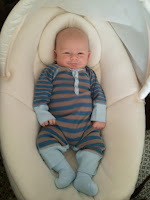 It seems like yesterday that I was writing a "three weeks" post and now Ethan is already three months old! I can't get enough of his giggles (his crying is another story, altogether) and look forward to all the new discoveries he is going to make in the next month. 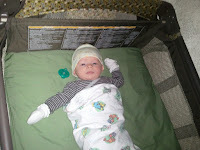 He is out of his "newborn napper" and is sleeping in the bassinet portion of his Pack N Play. 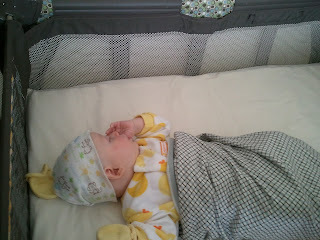 He is still in our bedroom -- the next step (within the next couple of weeks) will be moving to his nursery. In his newborn napper on Halloween. 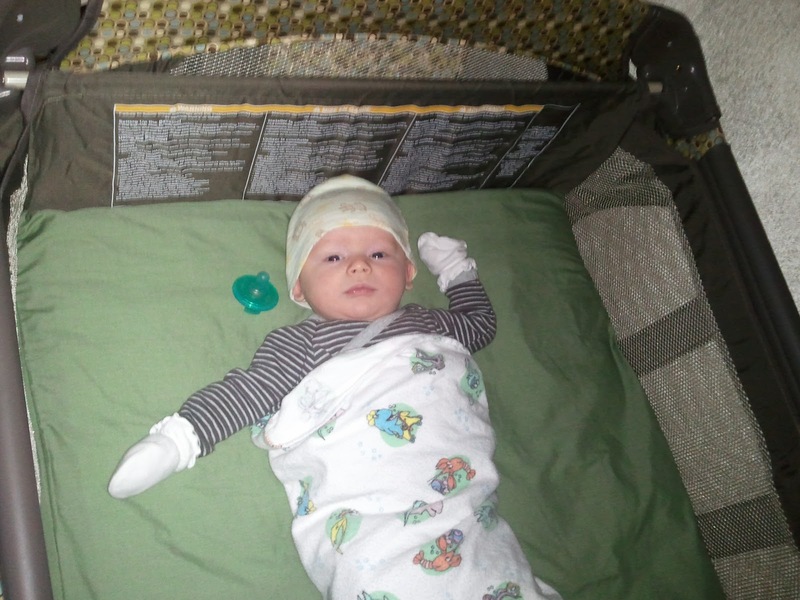 In the newborn napper in Dec.
More room to stretch out in the Pack N Play Bassinet. He started sleeping through the night on January 16th -- he will stay in bed (and quiet, although not necessarily asleep) for about 9.5 hours each night. I think the darkness and the sound of Cayne and I breathing (or snoring) helps to keep him asleep. I hope his wonderful nighttime sleeping doesn't stop once he moves to his own room. He has found his thumb and is pretty good at sucking it to keep himself asleep. He is a catnapping baby during the day. No matter what I do, I can rarely keep him asleep for more than 45 minutes. The only exceptions are when he is in his swing (sometimes) or when I'm running errands with him in the carseat (he's almost always asleep then). He weighs about 15.25 lbs according to our house scale. That includes his clothes so he probably weighs a little less than that. He has started to grab for and "play" with things that we dangle in front of him. By "play" I mean stare at it and/or try to put it in his mouth. He loves to sit up...in his Bouncy seat, in his Bumbo seat, or on our laps. He likes to stand. Of course, we have to hold him steady. He STILL hates tummy time. It's getting a little bit better but he protests very loudly! Here's a video of him trying very hard to get back onto his back...something he still can't do. His favorite toy is the mobile hanging above his changing table. I swear that he sometimes forces a diaper change just to see his insect mobile spinning. His favorite book is Peter Pan -- the Little Golden Book Disney version. He is starting to get more interactive with his books too. He went to his first class -- Kindermusik and seemed to enjoy being around other babies. 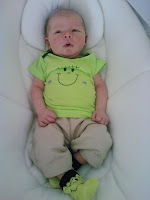 If clothing has attached feet, Ethan is now wearing the 6 months size, although he doesn't quite fill them out. For one-piece outfits, he can still wear the 3 months size, but the pants don't come down very far, so he needs tall socks. He "talks" all the time! He loves having "conversations" with us. I can't wait to hear him say an actual word someday. Happy 3 mos handsome nephew! I want to come play with you soon! You are getting so big and Mackenzie misses her little buddy who almost weighs as much as she does!